Eiffel Tower as seen in 24 vues de l’Exposition universelle de 1889 (1889). 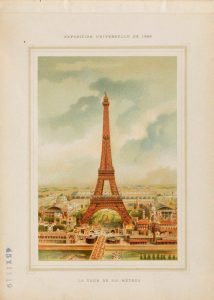 This 56-page book contains colorful illustrations from the world’s fair held in Paris, France in 1889. Known as the Exposition Universelle, this fair was held during the year of the 100th anniversary of the storming of the Bastille, an event considered symbolic of the beginning of the French Revolution. The main icon of the Fair was the Eiffel Tower (depicted at right) which served as the entrance arch to the Fair. You can find even more pieces on this fair in the digital collection. Memories of the world’s greatest exposition, St. Louis, 1904. This 66-page book is filled with black and white images from the Louisiana Purchase Exposition of 1904, held in St. Louis, Missouri for more than half a year. More than 60 countries and 43 of the 45 American states maintained exhibition spaces at the fair, which was attended by nearly 19.7 million people. The title references this event as “the world’s greatest exposition,” and the images in this book will surely explain why. The exhibition was grand in scale and lengthy in preparation. The fair was held to celebrate the centennial of the 1803 Louisiana Purchase. “A View Across Grand Basin”, from Memories of the world’s greatest exposition, St. Louis, 1904. 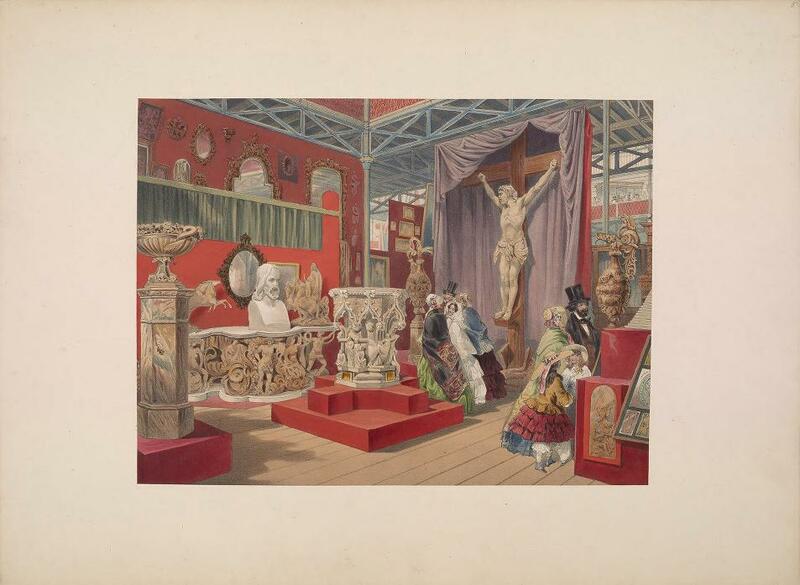 “Part of the Fine Arts Court” from Recollections of the Great Exhibition, 1851. 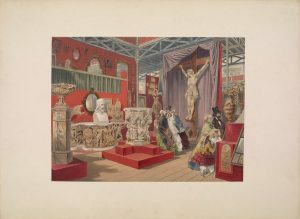 Recollections of the Great Exhibition, 1851. The Great Exhibition, also known as The Great Exhibition of the Works of Industry of All Nations, or more simply as the Crystal Palace Exhibition, was held in Hyde Park, London, England in 1851. It was one of the earliest world’s fairs and was a highly anticipated event. It was attended by many, including famous people of the time including Charles Darwin and Charles Dickens. This book contains a series of illustrations in color, of scenes from the fair. The images not only display what the fair looked like but you can also see the fashion of the times in the illustrations of the people.